Killing time with no particular purpose in front of the computer screen has turned into an “art” for many people. Some read news,blogs etc., while others engage in chat and some others play flash game. The internet is full of sites with dump flash games in ad-infested sites making it hard to enjoy your break time. Finding the right game for your, ten-minutes, purposeless session is critical. A very good site with great games is Kongregate. If you have not been there already do yourselves a favor and visit it. Your ten minute breaks (or more... why not?) will be spend on playing all sorts of games. 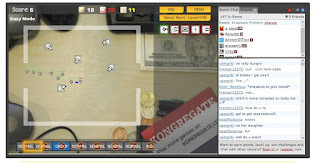 Kongregate hosts thousands of quality flash games of every genre and has a very active community of players. The games range from strategy and puzzles to multiplayer action games. One of my favorite has to be desktop tower defense, being a fan of tower defence mods for warcraft 3. The site sports a very useful search functionality and user rating for games, so that you can go through them and find those that you will enjoy. Have fun.